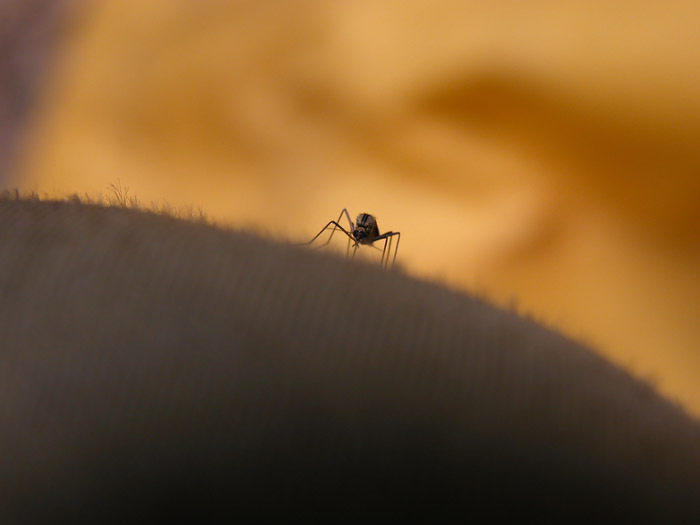 Once upon a time, in the Tanana river valley, it was a good month for mosquitoes. They were thick, and in the dark parts of the forest (especially near standing water) they would collect along the way as I walked. If I stopped they would swarm in clouds like bees defending a hive, but instead, they were buzzing for my blood. I had been walking for hours in 80 degree heat, using a modern version of an old Eskimo strategy for dealing with mosquitoes. In other words, I was wearing a hoodie (with the hood up over my head) to protect me from the swarm. After awhile I got pretty hot and sweaty and tired, and the prospect of stopping was getting downright scary – my constant movement was all that kept the mosquitos to a reasonable density. So finally, I sought refuge by breaking out of the forest and standing in the full sunlight on the banks of the Tanana river. This had worked before to bring relief, since mosquitoes often avoid open, sunny areas where they are hunted by dragonflies. And of course, if there was a even just a slight breeze coming off the river, that would help, since they are such weak fliers. But remarkably, the swarm followed me out of the forest and into the full sunlight. I was exhausted and had had enough. I needed a break from the incessant buzzing — from hanging out with sister mosquito, and I needed it now. Then a solution dawned on my tired, agitated mind. 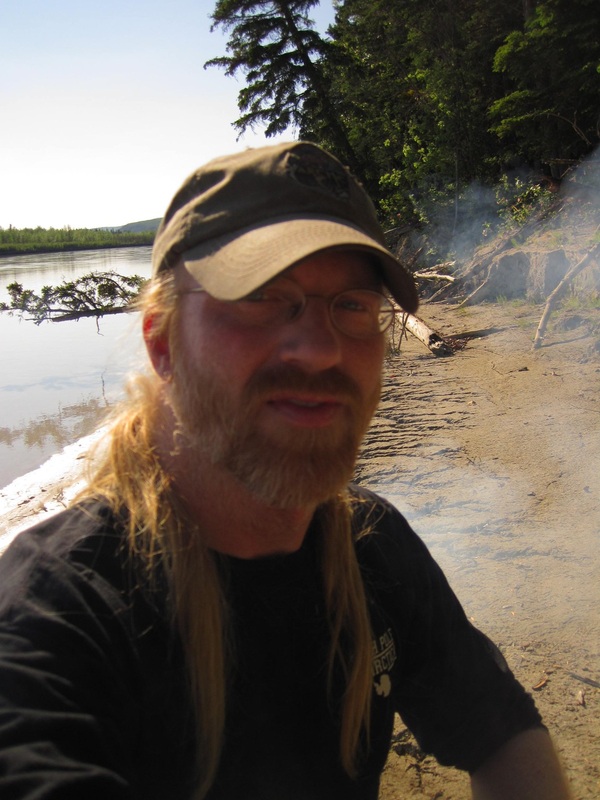 I walked over to the bank and grabbed a handful of dry, dead spruce branches, crumpled them up into a mass and set them on fire there on the silty bank of the river. 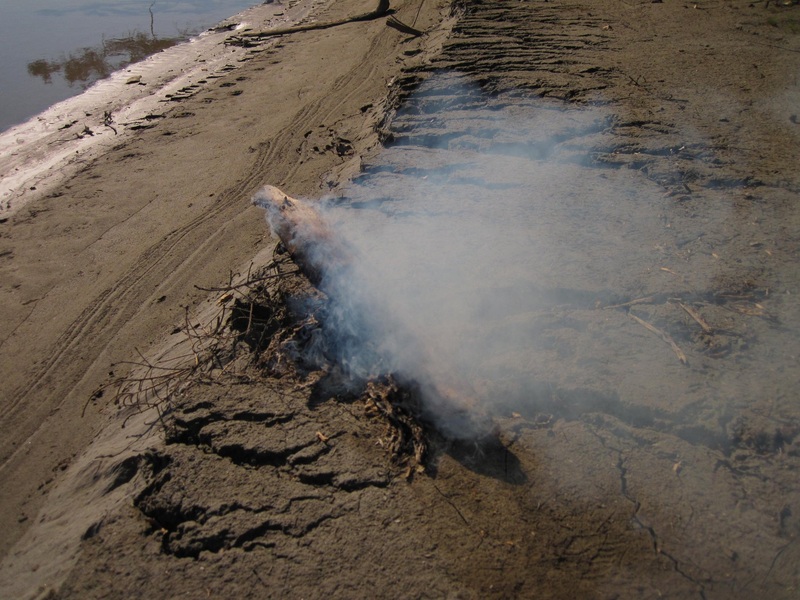 Then I picked up two thick pieces of rotten cottonwood from the forest floor and set them on top of the burning spruce. To top it off, I nabbed three pieces of half-wet driftwood from the very edge of the river and set them on the blaze. Packing all this wood tightly, with very little airspace between the pieces, the result was a thick smokey smolder. I stood in the smoke and wafted my hands through it so that it engulfed my whole body in billowing waves. Within minutes the bulk of the swarm had broken and fled, and within just a few more minutes not a single mosquito could be found. I dropped my pack, stripped off the hoodie, sat down and enjoyed the warm sun and quiet. The fire continued to smolder, but the smoke just drifted past my back side toward the woods. No need to sit right in the smoke now that sister mosquito was gone. The only sound was the water flowing by. No buzzing. Peace. Then a deep sigh of thankfulness. I rested & napped quietly for a few hours. And then, feeling downright refreshed, finished the hike back to camp.